The Kings of Punjab uses their own specialised couriers to deliver their food. Spinach and fresh vegetables lightly coated in spiced chickpea flour, and cooked until golden and crispy. A crispy pastry, filled with fresh vegetables and sumptuous spice mix. A crispy pastry, filled with lamb, fresh vegetables and sumptuous spice mix. Onions rings lightly coated in spiced chickpea flour, and cooked until golden and crispy. Lamb infused with herbs and sumptuous spices, cooked to perfection in the tandoor. Chicken pieces marinated in garlic, ginger, yoghurt and sumptuous spices, cooked to perfection in the tandoor. 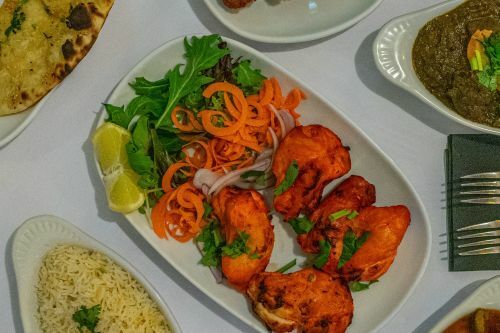 Half/ full chicken, marinated in garlic, ginger, yoghurt and sumptuous spices, cooked to perfection in the tandoor. Lamb cutlets marinated in mint, sumptuous spices and herbs, cooked to perfection in the tandoor. Tasty section of tandoori chicken, lamb sheikh kebab, vegetable samosa, and amritsar prawn. Tender prawns marinated in garlic, ginger, yoghurt and sumptuous spices, cooked to perfection in the tandoor. King prawns marinated in a mouth watering mix of yoghurt and sumptuous spices, cooked to perfection in the tandoor. Succulent prawns lightly coated in spiced chickpea flour, and cooked until golden and crispy. An all around favourite dish made from chicken tikka, aromatic spices in a mild creamy sauce. Tender chicken in a selection of spices, cooked in a coconut almond sauce. Delicious chicken tikka cooked with fresh capsicum and tomato. Tender pieces of chicken cooked with mushroom, onion and aromatic spices. Tender chicken pieces prepared with aromatic spices and cooked in a curry and coconut sauce. A tropical dish containing tender chicken cooked in delicious mango sauce and garnished with coconut. A chicken dish with our chef's personal flair, chicken cooked in aromatic spices and finished with egg. Chicken in a thick, creamy, delicately spiced sauce. Chicken marinated in special vindaloo spices, traditionally from Goa. Chicken cooked in a smooth spinach sauce with aromatic spices. Lamb or beef prepared in a rich hearty sauce with a selection of herbs and spices. Lamb or beef in a rich gravy finished with fresh cream and almonds. Lamb or beef in a thick, creamy, delicately spiced sauce. Lamb or beef cooked in a smooth spinach sauce with aromatic spices. Lamb or beef prepared with aromatic spices with a coconut sauce. Lamb or beef marinated in special vindaloo spices, traditionally from Goa. Succulent fish pieces cooked with aromatic spices and fresh capsicum and tomato. Succulent fish pieces marinated in a special mix of spices and cooked in a coconut sauce. Pan fried baby octopus delicately spiced and served in a fresh tomato, onion, capsicum and coriander sauce. Tender king prawns or fish marinated in special vindaloo spices, traditionally from Goa. Tender juicy king prawns cooked in a spice filled sauce with delicious fruit. Tender king prawns pan fried in a special mix of spices and cooked in a coconut sauce. Juicy king prawns pan fried with aromatic spices and fresh capsicum and tomato. Tender king prawns cooked in our decadent creamy sauce with aromatic spices. Juicy king prawns prepared in a tropical mango sauce and garnished with coconut. A variety of seafood cooked with aromatic spices and fresh capsicum and tomato. A traditional Punjabi dish made with mixed lentils and special aromatic spice mix. Garden fresh vegetables prepared with a delicately spiced creamy sauce. (DF optional) A mushroom, potato and pea dish cooked in mildly spiced curry sauce. Another traditional dish from Punjab with paneer, aloo or garden vegetables prepared in a smooth spinach sauce with aromatic herbs and spices. Seasoned pan fried potato and eggplant prepared with the chef's special masala. Garden fresh vegetables prepared with a curry sauce, can be served saucy or dry. Fresh from the garden, vegetables prepared in a thick, creamy, delicately spiced sauce. Cottage cheese, potato, sultana and a special spice mix rolled into savoury dumplings served in a decadent butter sauce. Kofta dumplings made with potato, cottage cheese and cashew nuts served in a Kashmiri sauce. A tantalizing dish of saffron rice cooked with fruit. An aromatic biryani dish consisting of saffron rice with delicately spiced chicken. A selection of tender beef or lamb delicately spiced in saffron rice. A delicious dish of spiced king prawns and saffron rice. A wholemeal bread cooked in the tandoor. Lightly fluffy naan cooked in the tandoor. Light fluffy naan topped with fruit and cooked in the tandoor. Light fluffy naan stuffed with cheese and cooked in the tandoor. Light fluffy naan stuffed with a mixture of cottage cheese, chilli, onion and coriander and cooked in the tandoor. Lightly fluffy naan stuffed with cheese and hint of garlic cooked in tandoor. A layered wholemeal bread cooked in the tandoor. Light fluffy naan stuffed with spiced lamb and cooked in the tandoor. Light fluffy naan stuffed with delicately spiced potatoes, peas and onion cooked in the tandoor. A combination of four accompaniments. Soft fluffy deep fried dumplings in syrup and garnished with coconut. A fresh mango and yogurt drink.